The Federal Election Commission levied nearly a quarter-million dollars’ worth of fines against three dark money groups for failing to report contributions from an organization run by Sean Noble after the Arizona political operative inadvertently disclosed the alleged violations in a 2014 interview. With the 2016 legislative session just a month away, Sen. Kelli Ward will resign her seat to focus full-time on her Republican primary challenge to U.S. Sen. John McCain. 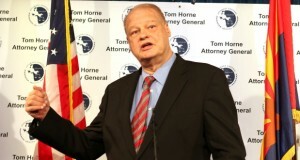 A five-year saga over the identity of the contributors who funded a Democratic campaign group’s ads against Tom Horne in the 2010 attorney general’s race ended on Monday after the group disclosed its contributors to the Secretary of State’s Office. State investigators are working to recover text messages that utility regulator Bob Stump sent and received during last year's Republican primary, Capitol Media Services has learned. Arizona's voter registration numbers are down by nearly 11,500 since the last report in January. The Secretary of State's Office says the state has more than 3.23 million registered voters as of April 1.